Apple’s tablet has grown in popularity partly as a sketchpad for doing less, and focusing more. A clean slate for music, it’s also a clean slate for software design. Or, that’s its potential. 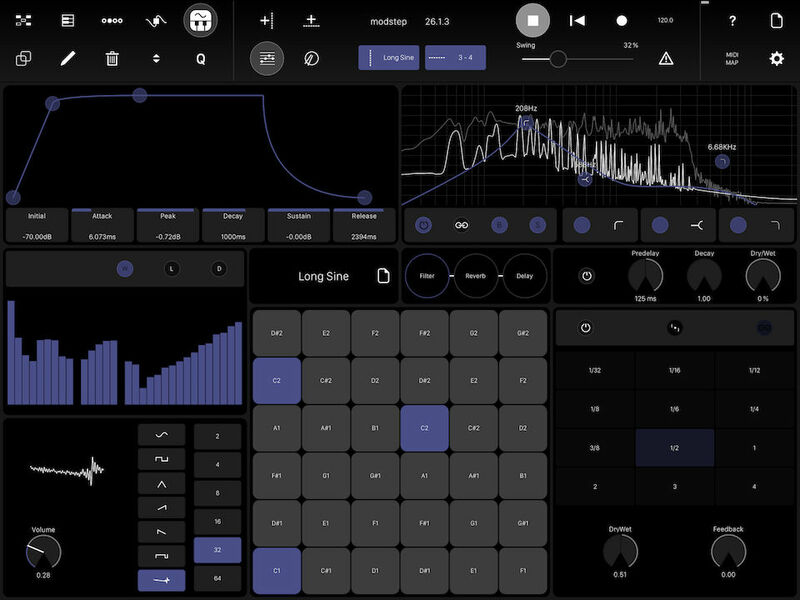 But while the iPad has become a platform for extraordinary instruments and controllers, for many of us it hasn’t yet become a hub for creating, arranging, and sequencing ideas. Modstep could change that. 1. Playing with rhythm and melody. 2. Tweaking my favorite synthesizers (software or hardware). 3. Messing about with sound recordings. Modstep in action on the new iPad Pro, right, versus an iPad Air, left. Amazing what happens with screen real estate. Modstep is not uncompromising in its simplicity. It has, in fact, a surprising amount of functionality packed into it. But what is is is a tool that starts with step sequencing as its soul, then builds around it all the ways you might want to create to your other tools, and to creative sound design. It’s probably overwhelming for the absolute beginner Auxy is targeting, but then it becomes immediately appealing the moment that same user buys a KORG volca series or (we hope) a MeeBlip. Steps and clips are at the heart of the interface. 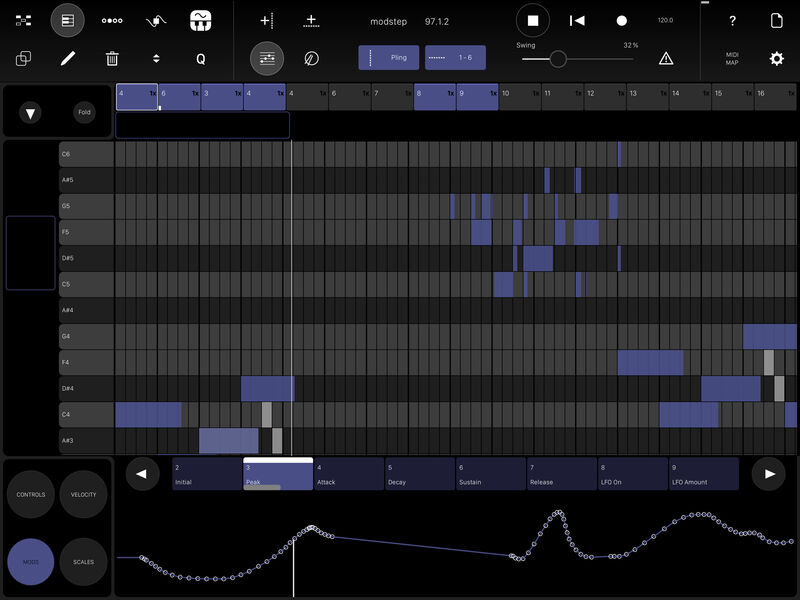 And if in the past the iPad has shown us how powerful it is to touch sound with our fingers, ModStep shows us how powerful it is to touch sequences. From notes to modulation, you get everything you love about a sequence, liberated from having to get at it with a keyboard and mouse. Whatever bias that may make me feel (and those of you who know me knows I’m biased toward generally arguing with my friends), I have gotten to watch it evolve. I was frankly worried along the road about feature creep and complexity. But with version 1.0, I finally get a sense of where they were going. It lets you build patterns with live input, steps, clips, and sets. The core “atom” of Modstep is a step sequencer, complete with sliders and the like. But you can also play music live (with chords and with note repeat if you choose), and chain and loop patterns into bigger sets. An Ableton-style clip view keeps everything organized. That means you can approach this as a simple monophonic XOX sequencer, or go nuts with tons of patterns. 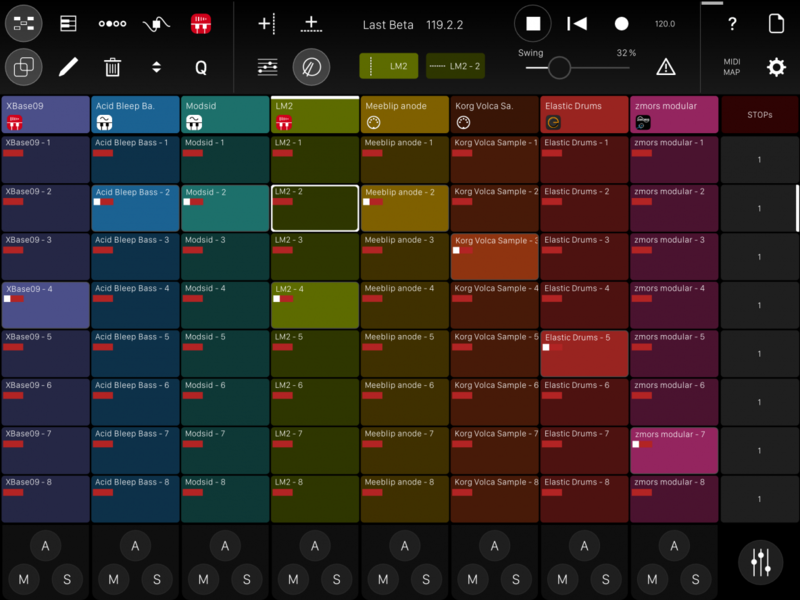 And… sorry, Elektron lovers, but that also means an iPad Pro is a compelling competitor for an Octatrack. It’ll be fun to watch those camps duke it out, actually. It’s a hub for hardware. With full MIDI interface support and the ability to both control Modstep from external gear and use Modstep to control external gear, Modstep is a return to the days when a dedicated sequencer was the hub of your workflow. It’s a hub for apps and for sequencing desktop software. 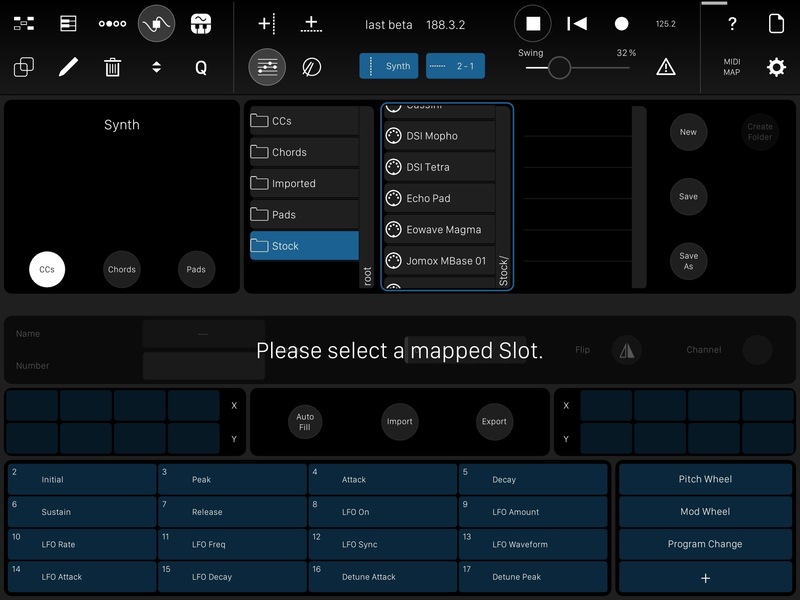 Want to control synths on your computer or your iPad instead? 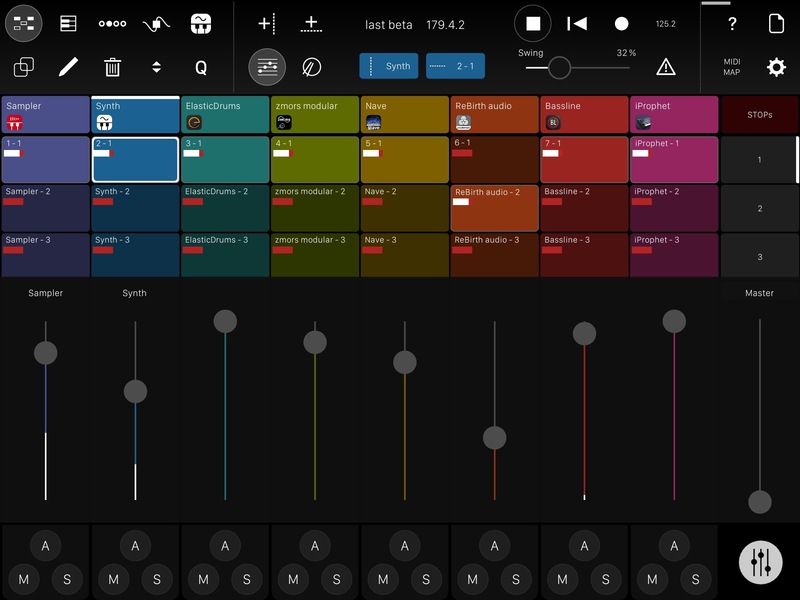 Or add in instruments and effects from your iPad, via Apple’s Inter-App Audio (IAA)? 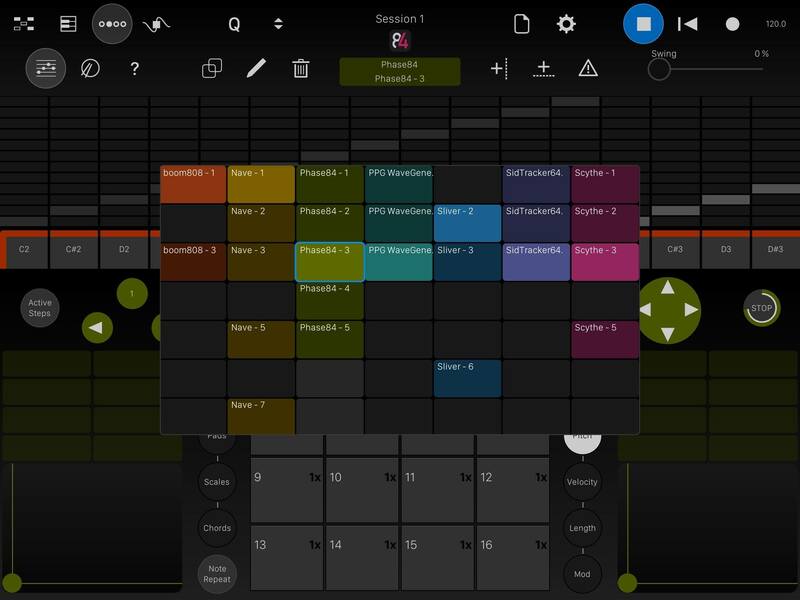 Modstep acts as a central music-making tool for the apps you’ve collected, too. There’s even a built-in IAA mixer. The powerful template editor, which comes pre-equipped with a library of useful templates. That makes Modstep a librarian as much as a sequencer. It uses templates to keep track of everything. If you’re going to play and modulate hardware and software, you want access to all the parameters on those instruments. A custom template editor, plus a bunch of built-in templates (like our own MeeBlip) let you make Modstep into a kind of sequencer/librarian. It’s got its own synth and drum sampler. If Modstep were just a sequencer, it would fall silent whenever it was disconnected from external gear or apps. 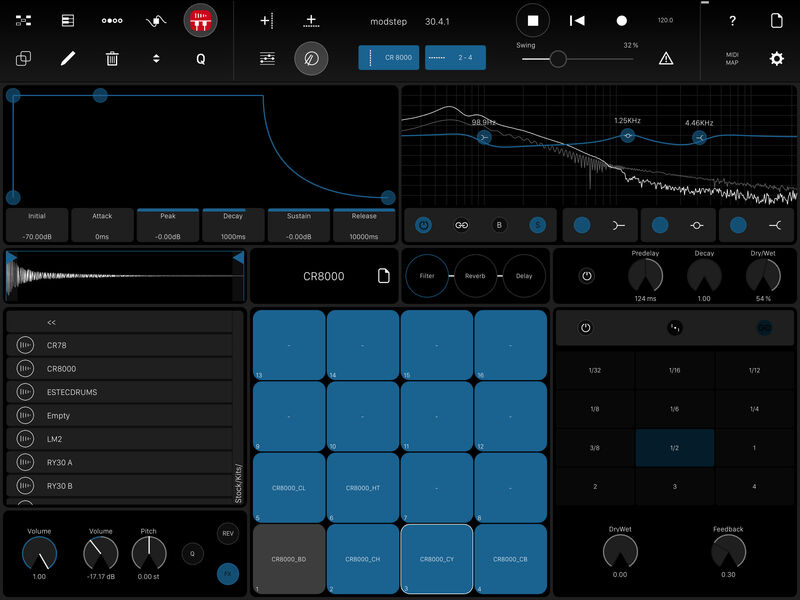 Instead, Modstep here works with a built-in drum sampler and synth. The drum sampler is especially nice, because it means Modstep on its own is a workstation for sampling and arrangement. Also, having watched Benjamin in the studio, I’ve been slowly converted to the Modstep way of doing things. The combination of hardware templates with extensive modulation editing means that any sequencer immediately gives you tremendous control over that gear. (I’m still more, ahem, minimal in my modulation than Mr. Nerk.) And if you aren’t playing MIDI lines on pads or keyboards or other physical inputs, it’s hugely useful to have Modstep around as a sequencer. I’m on the road a bunch this month, so I may find that a lifesaver, because I won’t have my controllers around. If step sequencing isn’t always your game, there’s a piano roll view, as well. 1. Gives you up to 256 steps per track so anything from 1/256 to 256/256 steps. 4. Clips which contain tracks and give you ableton style clip launching paradigm. 10. Stable external Midisync (swingable)!!! I suspect for many of you, this epic feature list is probably making you want an iPad if you don’t have already. So, which iPads are supported? Actually, this could be a chance to keep an older device from collecting dust – or an excuse to look for someone who wants to sell you (or give you) even their first-gen iPad. iOS 5 and later: MIDI. iOS 7 and later: Internal synth, Inter App Audio. 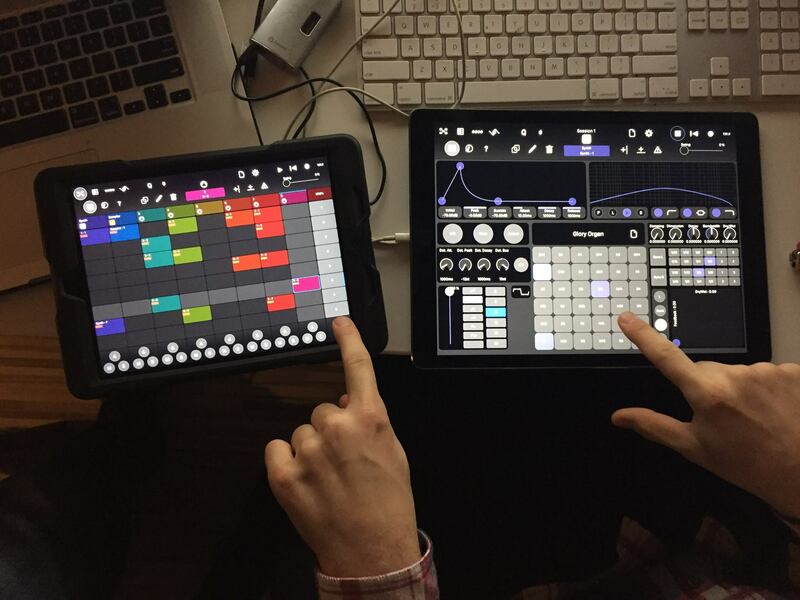 Now, all of this should make it clear than an iPad can become a dedicated tool for music making. In fact, it might make the iPad Pro look more appealing. But there are ways you could use this with a computer, too. The developers of Modstep also made my favorite iOS-to-computer MIDI and audio connection tools, Midimux/Studiomux. So, naturally, you could use Modstep connected to a laptop not only as a controller, but also streaming audio from its internal synth and drum sampler (and connected apps) back to a desktop DAW for more serious arrangement, editing, mixing, and processing. Version 1.01 is coming, too; Modstep tells CDM that will bring some significant bug fixes as well as support for Ableton’s Link technology. Link will be a huge boon: it’ll let Modstep users jam together, wirelessly, with a couple of iPads, or let you sync up with Ableton Live. Modstep is US$19.99 on the App Store. We’ll have more videos showing how to work with it over coming weeks, no doubt.